Our life as a parish finds its expression in many ways and extends from our gathering for worship every Sunday morning. We take seriously Jesus’ table fellowship, and it is rare that we come together without sharing food in some way. We gather in small groups, from the Lunch Bunch on Thursday mornings, to our Loaves and Fishes meals all over the East Bay, to our regular Continuing the Feast potluck meals. We also gather regularly as a parish for celebrations, from Shrove Tuesday/Mardi Gras to the Feast of St. Mary the Virgin to our fall harvest celebration, filling our parish hall with song, story, and amazing food. 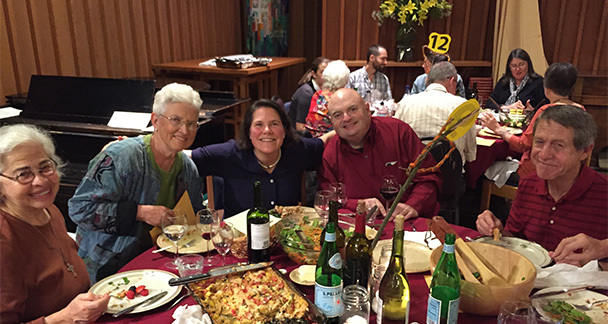 Every year, at the start of the fall, we make a Parish Retreat as a community, young to old, at one of our Diocesan retreat centers, the Bishop’s Ranch in Healdsburg, CA. At the Ranch we rest, reflect, pray, hike, play, sing, eat, relishing the time spent with one another in holy space. And sometimes we just have fun. There is a parish camping trip in Big Sur every summer along the Big Sur River, an annual parish picnic in Tilden, several affinity groups to meet almost any interest and depending on the local sports season you’ll find groups from All Souls from under ten to over eighty, at A’s games, and at Cal basketball or football games.